Listening tests are widely used to assess the quality of audio systems. In the last few years, conducting listening tests over the Internet, as so called web-based experiments, has become popular. Until now, it was only possible to implement a limited number of listening test types as web-based experiments because web standards were missing some crucial features, e.g. sample manipulation of audio streams. 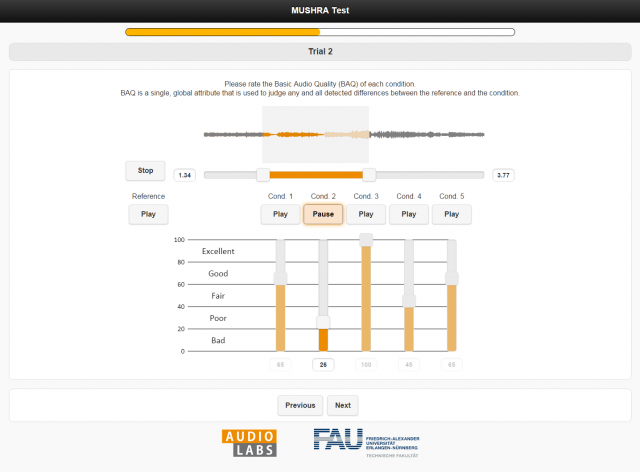 MUSHRA tests designed are designed to compare the audio quality of several test conditions with intermediate impairments to a high quality reference. With the upcoming of the Web Audio API, for the first time MUSHRA experiments can be carried out within the web browser while at the same time being compliant to the ITU-R Recommendation BS.1534 (MUSHRA).